Changing your diet to limit or completely exclude most foods isn’t a healthy or balanced way to lose weight, even if you enjoy what you’re eating. 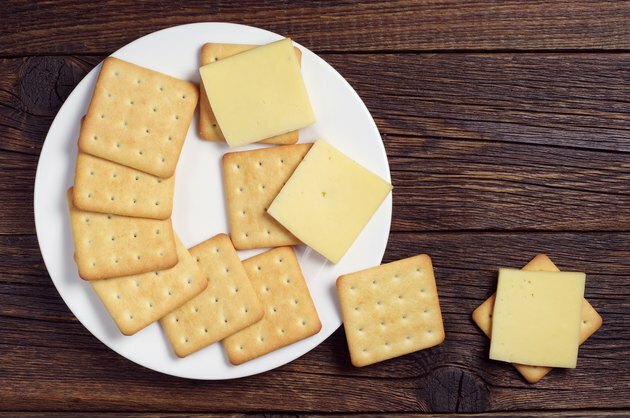 Cheese and crackers provide a decent amount of variety and may help you slim down if you can reduce your calorie totals while eating them, but it’s still a far healthier choice to follow a more varied diet instead. Depending on the types of cheese and crackers you choose to eat on your diet, you could cut daily calories or increase them by quite a lot. For example, 2 oz. of cheese-flavored crackers have 145 calories, 7 g of fat and less than 1 g of fiber, but 2 oz. of crisp rye crackers have just 105 calories, 0.5 g fat and more than 4.5 g fiber. A 2-oz. serving of whole-wheat crackers has 240 calories, 8 g fat and nearly 6 g fiber. Cheese nutritional information also varies widely. An ounce of cheddar has 115 calories and 9.5 g fat, while 1 oz. of feta has 75 calories and 6 g fat. The same amount of Swiss cheese has 110 calories and 8 g fat; 1 oz. of cream cheese has 100 calories and almost 10 g fat and 1 oz. of soft goat cheese, like the feta, has 75 calories and just 6 g fat. There are many potential benefits to including moderate amounts of cheese and crackers in your diet. Crackers can be rich sources of whole grains, and according to ChooseMyPlate.gov, grains have the ability to reduce your risk of heart disease, high cholesterol, obesity, diabetes and constipation. Cheese is high in protein, which means it can contribute to building and repairing skin, blood, bone and lean muscle tissue. For weight loss, a major con of following a cheese and cracker diet is that both items are relatively high in calories. You need to create a 3,500-calorie deficit in order to lose a pound of body fat; as a result, you aren’t likely to lose as much weight on a cheese and cracker diet as you might by replacing meals with low-calorie protein shakes or large green salads instead. Another con has to do with nutrition. Although you’ll get protein, carbs and fat by eating cheese and crackers, you’ll miss many of the essential vitamins and minerals you’d get by eating fruits and vegetables, and you may eventually develop nutrient deficiencies. There are plenty of healthy alternatives to following limited diet plans such as a cheese and cracker diet. The National Institutes of Health recommends gradually losing weight by eating low-calorie whole grains, lean proteins, nonfat or low-fat dairy, fruits and vegetables, which constitutes a permanent, balanced eating plan you could follow indefinitely. Before you start any diet for weight loss, consult your physician or a registered dietitian for approval. Are Cheese & Crackers Healthy? Can I Eat Ricotta Cheese When Pregnant?